When emergencies happen and danger strikes, quick and dependable access to gear is essential to making it out alive. 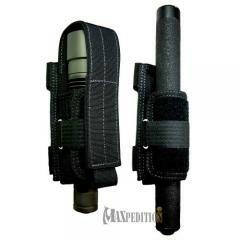 The Universal Flashlight / Baton Sheath from Maxpedition provides the versatile item carry options that law enforcement professionals have been searching for. The sheath features an adjustable body that can accommodate virtually any size baton or flashlight. It is constructed from ultra-tough 1000 denier nylon that is both abrasion and corrosion resistant, making it ideal for use in any environment. Internal Velcro straps are used to change the length of the carrier's in order to offer the perfect combination of item coverage and retention strength. The holster can be worn vertically or horizontally.